DALLAS – The Army & Air Force Exchange Service continues its celebration of returning combat troops this August with a variety of prizes available during its weekly Homeward Bound giveaways. Through Aug. 7, one entrant will win an Exchange gift card worth $1,000 courtesy of ASICS. Two runners-up will each receive Exchange gift cards worth $250. Aug. 8-14, five winners will receive a Serta adjustable mattress set worth $3,000. Aug. 22-28, two winners will receive a $3,000 Samsung entertainment package including a 55-inch 3D LED Smart TV, 3D Wi-Fi Blu-ray player, Sound Stand, 10.1-inch Galaxy Pro tablet and Galaxy Camera 2. To enter the Homeward Bound contests and for more information about upcoming promotions, authorized shoppers can visit www.shopmyexchange.com/homewardbound. DALLAS – Whether stationed at home or abroad, servicemembers can expect to find the same, or very similar, prices at Army & Air Force Exchange Service facilities worldwide. Known as pricing parity, this practice ensures Exchange prices are established centrally. Additionally, prices for some convenience and frequently purchased items may be lower at different locations based on local promotions or surveys. To ensure prices on these same items overseas are consistent with those servicemembers would expect to see at home, overseas prices are set at the average surveyed CONUS price. Servicemembers and their families worldwide can learn more about Exchange policies by visiting http://www.shopmyexchange.com/CustomerService/ . DALLAS – Summer just got a lot sweeter for Travis Exchange shopper Fe Lauron of Castro Valley, Calif., who won $15,000 through the Army & Air Force Exchange Service’s Lindt Chocolate Sweepstakes. The sweepstakes, which ran from March 7 to April 17, offered a randomly-drawn winner a choice between a brand-new Volkswagen Beetle or a $15,000 cash prize. Lauron picked the cash, and she was presented with a check for the full grand prize amount on July 2 at the Travis Exchange. The Exchange holds dozens of sweepstakes per year in addition to offering tax-free shopping and free shipping for online orders. For the latest on Exchange sweepstakes, call or visit your local Exchange. DALLAS – Military shoppers can keep time with Hello Kitty thanks to the latest sweepstakes from the Army & Air Force Exchange Service. Twenty-five winners will take home a Hello Kitty watch, valued at $85. From July 25 to Aug. 22, Exchange shoppers can enter to win by emailing patriotfamily@aafes.com and putting “Hello Kitty Sweepstakes” in the subject line. The body of the email must include the contestant’s name, address, nearest Exchange, daytime phone number and rank or occupation of sponsor. Exchange shoppers can visit www.shopmyexchange.com/patriotfamily for complete contest rules. Winners will be selected on or about Sept. 1. DALLAS – With the first bell about to ring on a new school year, the Army & Air Force Exchange Service is giving lessons in savings. 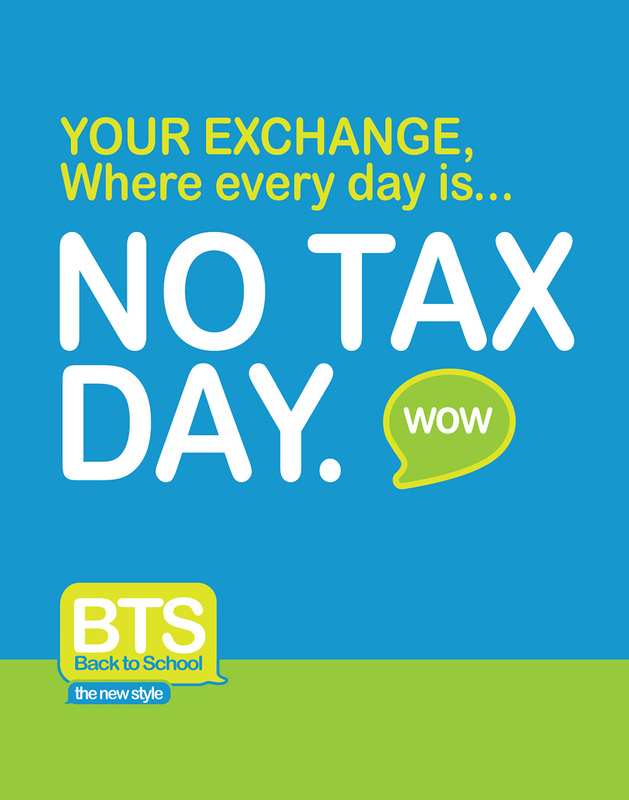 The Exchange is helping military shoppers make the grade with competitive prices and tax savings on supplies students need to head back to class as well as special events and savings opportunities for the whole family. As several states roll out “sales tax holidays” on school supplies, the Exchange will match local sales tax discounts to offer an additional percentage off (equivalent to the local sales tax rate) select back-to-school items, effectively doubling the Exchange’s everyday tax-free benefit. The sales tax holidays start in Mississippi on July 25 and continue in 15 states on various dates through Aug. 10. Shoppers can check with their state’s tax website for sales tax holiday dates and included items. On Aug. 9, select Exchange locations will host a special back-to-school event in their malls as part of the yearlong Homeward Bound campaign. The event will include product samples, giveaways and more. *MILITARY STAR® Promotions subject to credit approval. Standard account terms apply to non-promotional purchases and, after promotion ends, to promotional purchases: As of July 1, 2014, a variable 10.24% APR applies to Retail Plan Purchases; and variable 18.24% APR applies to accounts subject to Penalty APR. Minimum Interest Charge: 50¢. See Exchange Credit Program Agreement for more details. DALLAS – On July 25, the Army & Air Force Exchange Service marks a historic milestone, celebrating 119 years of serving Soldiers, Airmen and their families. On July 25, 1895, General Order No. 46 established the exchange on military installations, directing post commanders to set up an exchange at every post. Since then, the Exchange has supported U.S. troops in 14 major contingencies, starting with the Spanish-American War and most recently with Operations Enduring and Iraqi Freedom. Throughout the years, the Department of Defense’s oldest retailer has brought a taste of home to the frontlines while supporting service members’ families on the home front. In honor of the anniversary, the Exchange is planning in-store events worldwide and a special MILITARY STAR® card promotion. Shoppers who use their MILITARY STAR® card on July 25 will receive 5 percent off their in-store purchase. The MILITARY STAR® card 5 percent discount is not applicable to fuel, tobacco, uniforms/accessories, Exchange Protection Plans, food court or gift card purchases. The MILITARY STAR® card everyday discounts of 10 percent off fast food and 5 cents off per gallon of gas will be applicable but cannot be combined with the 119th anniversary 5 percent discount offer. Military shoppers can join in as their local Exchange celebrates 119 years of family serving family. To find locations, shoppers can visit www.shopmyexchange.com/ExchangeStores/. DALLAS – The Army & Air Force Exchange Service’s Homeward Bound campaign is heating up with a variety of giveaways to celebrate the homecoming of America’s warfighters and honor those who serve. One of six $5,000 Exchange gift cards courtesy of Burger King from July 4-31. Two chances to win a trip for two to Las Vegas to see the Mr. Olympia competition. Shopper can enter from July 7-14 to win a trip from Nutrex Sports Nutrition or from July 18-24 to win a package from Iovate nutritional products. One of 10 $750 Exchange gift cards, courtesy of GoPro from July 25-31. For more information about upcoming Homeward Bound promotions, shoppers can visit www.shopmyexchange.com/homewardbound.